The digital revolution has presented us an enormous opportunity for healthcare enterprises to interact and engage with people on a regular basis, thus providing a better lifestyle. The envious vision to create a propitious digital ecosystem that helps enterprises to reflect empathy through pragmatic approaches intrigued a sensible amount of health/fitness enthusiast to explore online platforms. Sensing the intangible power of digital delivery platforms and recognising the needs for better health care systems, a new breed of internet entrepreneurs sprout, whose primary focus is to provide transparent, affordable, and high-quality health care services using online channels. The Best Part: countless eCommerce website builders are out there which meets your market demands and offer a complete solution that comes in handy when deciding an online platform. The accessibility of data has an overwhelming effect in educating people and soothing their pain with actionable and affordable remedial measures. A decade back the biggest challenge was identifying people and the major health concerns they face (Thanks to health care forums), now it dwindles to visibility. 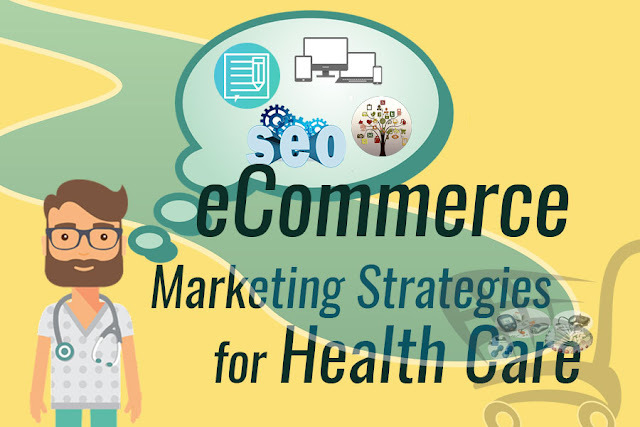 In this article, we will discuss what marketing channels should an eCommerce based health care enterprise should implement to attain the prodigious market presence they fantasise. A well designed and professionally maintained website is the key to gain trust and inspire people to value your online presence. People are so judgemental, so don’t let your website trigger suspension or confusion. Your authority as a health-care provider will greatly influence people. So, highlight video testimonials, recognitions, case-studies, etc. Plan your online store with an artistic skill, but never overdraw the picture (Make the web page look interesting. At the same time keep in mind, that over complexity nullify the effect). Delineate what you are providing so that the visitor sees what he expect to see. For eg: If your eCom store is more focused on selling products related to paediatric care. Then your home page should reflect a message that you are an online store that sells specialised products for the particular niche (Children's/ babycare products). Seamless user experience is of higher importance. The key to providing a superlative user-experience is in knowing who the decision maker is, and what target demographic will interact with your website. For eg: When comes to paediatric care, who plays a major role in decision-making. It’s obvious that predominantly the decision makers are females. So how will I convince a female to buy products from my eCom store? Ask questions like, what product was she searching for. Okey, she was searching for “Anti allergenic Baby blankets”. So now the next important question is, how will I add value to her search. Great question, Once she is on the website landing page, provide additional products that a pregnant woman needs. Also, the search query implies that she is well educated and health conscious, that's the only reason why she triggered a search “Anti allergenic Baby blankets” instead of “Baby blankets”. In such cases, the similar products you try to upsell should not make her feel that the website also sells cheap baby care products on a commercial point of view. The on-site navigation needs to be simpler. Provide breadcrumbs to show how the navigation is progressing. Guide the online visitors, from landing page to the shopping cart, and from to the payment gateway. The process needs to be designed seamlessly, let’s say that it's her first visit to the website and she doesn't have an account. Give her the option to purchase from you as a guest or create an account, Give the customer the freedom to decide whether they like to share here private information or not. If your eCommerce store is brand new and people are not aware of your presence then along with a trusted payment gateway give a COD (Cash on delivery) option. That way you are providing the customer with an opportunity to physically check the product and make payment once it arrives the door steps. Highlight benefits the user will be getting rather elaborating on features. With Mobile being one of the main channel used to trigger a search, make sure that your website is responsive and the User experience part is not compromised. Most websites make the mistake of not putting their website to rigorous testing, Test your prototype and use the feedback to increase the website performance. How each widget and pages orient across digital platforms, Keep in mind that sporadic innovation and scalability matters. Creating engaging and useful content for your target audience is the best strategy to commercialise your health care merchandises online. Thinking why! people value information that offers a solution in their day to day life. For eg: In the case of an eCommerce site that sells baby products, the online store can create blog content which helps parents to take care of their toddlers with safe and effective practices. Create articles for people at different stages in the buyer's journey. Take a glimpse at the titles below. Decision stage - Title: The Best anti allergenic blanket for baby care. Continuously posting your articles on social media (Continuously posting helpful articles and interact with people on social media helps create a strong social presence). Engage on health care forums and roundups. Suppose someone has shown interest to your business and subscribed through an article titled “Tips for pregnancy care”. Here the prospect is interested in the above topic, that shows a need towards pregnancy care. Here the prospect is not prepared to buy your product. So the next step needs to be concentrated on educating the prospect, how the solution/ product you are providing will add value to their life. Identify their need, map it to your business synergy and motivate them to buy the service/ product you are offering. Emails, SMS, Whatsapp, etc helps to interact with your prospect on a regular basis and nurture the leads down the buyer's journey. The above-mentioned strategies are much effective in commercialising your eCommerce store. But when comes to purchase, be cognizant about the service quality. Maintain a vibrant support who can address the visitor/ user's query. That being said let me conclude, as an entrepreneur keep your spirits up. The market is so vulnerable, Over time your business will be tested with risks and uncertainties. The recent one being GST, Even at the heart of disasters there are still hopes for entrepreneurs. As a healthcare entrepreneur, with thousands of souls longing for your services, it becomes an obligation to find a solution, Like benefits of GST, and use it to your advantage. Who knows may be one day, even at the brim of ethical dilemmas and dementias your eCommerce store may evolve to be a protagonist offering a solution to all sentients who coven in the cosmos to pursue a healthier life.